Somebody else typed this classic/obscure dungeon up, but unfortunately left if in raw HTML for some reason, so this post is to rectify that. It did a couple things to enhance it too. Hit the print-friendly button at the bottom of the post to have your own PDF, dudez. Many years ago, the Shrine of Kollchap flourished. Priests of Chaos made human sacrifices and their servitors raided the lands around for new victims to satisfy the thirst of the Chaotic god. The villagers, at first, were too terrified to do anything, but at length collected a small army and appealed to the King for aid. He sent only his champion, Amaul, bearing The Sword of The Sorcerer. Together, they marched to Kollchap and drove out the priests and their allies. Amaul, however, was killed in the assault and the sword has never been seen again. 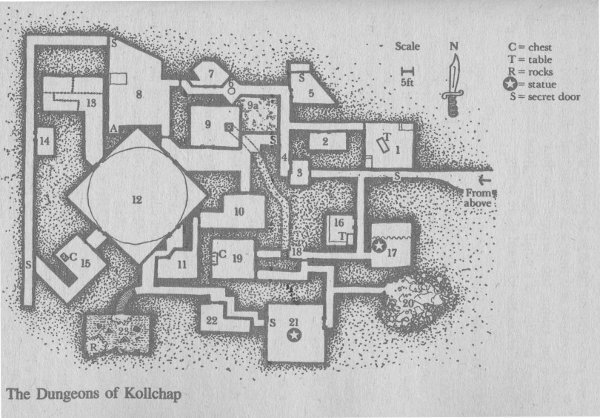 Just recently, the Priests of Chaos have begun to re-occupy Kollchap and some villagers have been abducted. If the Sword of the Sorcerer were to be recovered, the shrine could once again be cleared out and, this time, finally destroyed. When the players arrive, they will see what appears to be the remnants of a Grecian-style temple. Pillars are broken down and the roof is badly cracked, but there are signs of rebuilding. The middle of the temple is bare and at the far end there is an irregular hole in the stone floor. The hole is slightly larger than a manhole (four feet in diameter) and is large enough for a man to pass through with ease. Lurking in the ruins are two ugly humanoid creatures with earth brown skin (Hobgoblins). They will observe the party from a distance and will not attack unless anyone tries to climb through the hole or they themselves are attacked. 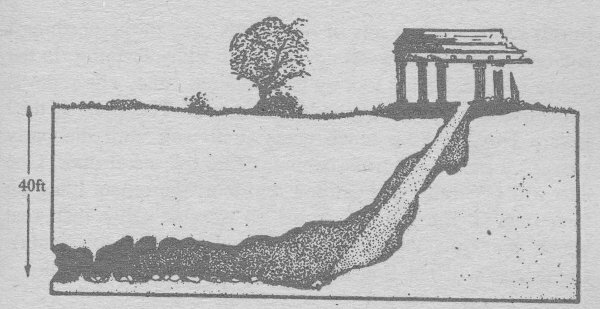 The hole leads down about forty feet and ends in a tunnel. Although the descent is not vertical, it is still fairly steep and unlit, and so characters attempting to climb down it without taking suitable precautions, such as using a rope, may well fall. Roll Dexterity or less on a d20 to avoid this. Additionally, any character hit in combat while trying to get down the hole must roll five or six on a d6 to avoid falling. A fall will cause a character to take 1-6 damage. The tunnel is ten feet high and there are many stalactites and stalagmites along its length. After about thirty feet the party will disturb a nest of bats. These will fly at the party and cause confusion. If any character engages in combat, with a wandering monster, for example, while the bats are flying around his head, he will have a penalty of 2 on his 'to hit' roll. No spells can be cast in this confusion. General: The majority of passageways in this dungeon are five feet wide except for those leading on to the central Sacrifice Room (12), which are ten feet wide. They are all ten feet high, and walls, floors and ceilings are made of stone. There are no light sources in any passageways. Unless otherwise stated, doors are six feet high and three feet wide and made of oak. They open into rooms; and doors between two rooms open into the higher-numbered room. All doors must be opened in the normal manner (i.e. Base Chance of 1-2 on d6). take one turn to collect it. the Slime and half to the character). knows of the Orcs and the secret door in Room 1.
poison, doing 1-6 hit points damage. underneath the bed is pulled. but is worth about l00 gps. has 76 sps in a pouch. join the party, in gratitude. with 50 gps if he is conducted safely out of the dungeon. of Protection from Evil and two of Cure Light Wounds. corridor. The stairs lead up into the upper world. down have come away from the wall. The tunnel leads to Room 9.
pouches, 6 sps, 7 sps, 2 eps and 3 sps respectively. This room is a cave littered with rocks and boulders. The walls are damp and the atmosphere is humid. Amongst the rocks are two Cave Locusts, but because of their Grey color they may not be noticed at first. In the entrance of the cave there is the body of a human in plate mail. He was one of Belisarius's party (see Room 5). In his hands are a sword and a burnt-out torch. There is nothing of any value on the body except a map, showing Rooms 1, 2 and 5. There is no treasure in the room. Then I will speak confusingly. will be nonsense. There is a secret door in the west wall. paintings of Halflings being tortured and maimed! feet of any Chaotic creature.